(Francisco Kjolseth | The Salt Lake Tribune) Utah Utes guard/forward Dre'Una Edwards (44) leans back as she shoots over UCLA Bruins forward Michaela Onyenwere (21) at the Jon M. Huntsman Center in Salt Lake City on Sunday, Feb. 10, 2019. Utah’s two home losses to unranked women’s basketball teams were barely enough to cause voters to move the Utes out of the AP Top 25, announced Monday. 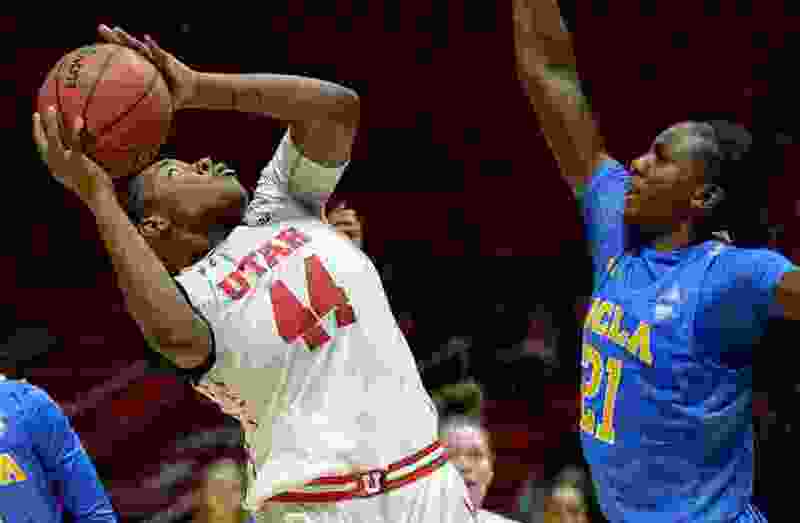 The Utes (18-5) fell 84-80 to USC on Friday and 100-90 to UCLA on Sunday at the Huntsman Center, extending their losing streak to four. Losses at now-No. 3 Oregon and No. 9 Oregon State didn’t hurt the Utes much in last week’s rankings, but they fell from No. 17 into the receiving-votes category this week, the equivalent of No. 26. South Dakota (22-3) joined the rankings at No. 25, replacing Utah. The Coyotes were awarded 42 points in the poll to Utah’s 32. The Utes debuted at No. 21 three weeks ago, when they stood 16-1. They moved to No. 14 at 18-1 after an upset of now-No. 10 Stanford, then dropped to No. 17 at 18-3. The bigger issue for the Utes is they've fallen to sixth place in the Pac-12 at 7-5, going into games Friday at Arizona and Sunday at No. 19 Arizona State. The top four teams will receive first-round byes in the Pac-12 tournament in Las Vegas. Even after Utah’s two losses, forward Dre’Una Edwards was named the Pac-12 Freshman of the Week for the fifth time this season. Edwards totaled 31 points and 13 rebounds against USC and UCLA. Ute freshmen Dru Gylten and Andrea Torres also have contributed to the team’s eight weekly awards, tying the record set by California in 2015-16 — all won by Kristine Anigwe. Ute senior forward Megan Huff was named Monday to the 30-player Citizen Naismith Trophy Midseason Team. Huff is averaging 20.2 points and 9.9 rebounds and has scored in double figures in every game.